Rubber mat features the Jetta logotype. Extra-deep grooves provide carpet protection and trap debris and liquids. 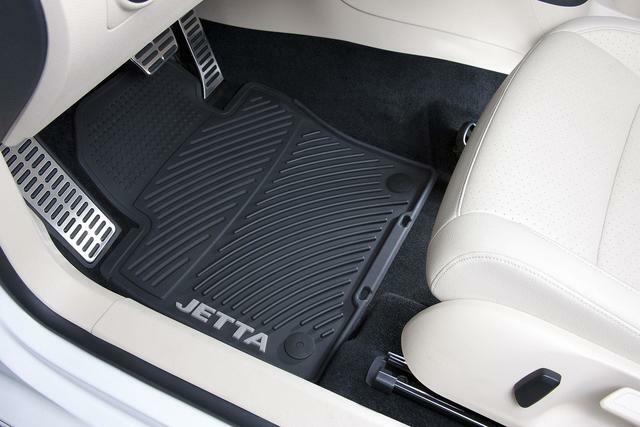 Easily hosed off.Round/Oval Retention Clipsand nibbed back keep these floor mats in place. Set of Four(4). Black. Set of four- with TDI Logo. High quality mats- made to take the abuse of an active life style. Help protect vehicle carpet from snow- sand- mud- rain and slush. Positive retention clip and a nibbed back help ensure mats stay in place.